Using MDF to ISO is simple and involves selecting any MDF file available from a location on your hard drive and then selecting the destination ISO file. 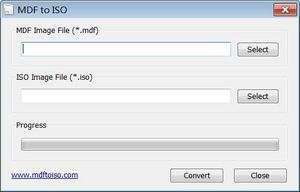 Once both are selected, click the Convert button and after a little bit of time, you'll have a brand new ISO file. The program is freeware and requires no technical knowledge. For security reasons, you should also check out the MDF to ISO download at LO4D.com which includes virus and malware tests. Additional screenshots of this application download may be available, too.